Don’t miss Community’s chance to meet with the Architects, QVM Precinct Renewal Team, and Market Management to chat about this component which will enable traders and shoppers to continue their business as usual during the market re-development. 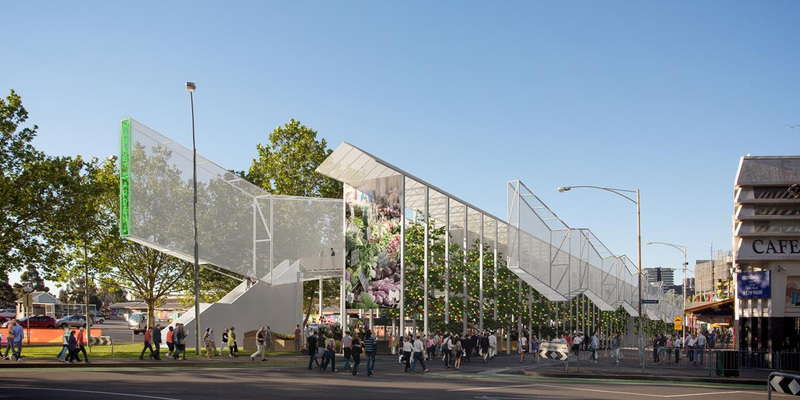 A planning permit has been lodged for a new temporary market pavilion expected to open at Queen Victoria Market late this year. Located on Queen Street, the pavilion will ensure temporarily relocated traders can continue to operate right throughout the five-year renewal program. The new two-storey, greenhouse-inspired design, will include an open air trading hall on the ground level and a market garden on the upper level. The pavilion will give traders better access to refrigeration, water, power and storage and include a number of sustainability features. It will also provide many exciting reasons for people to shop at the market while renewal works are underway. It will house traders who need to relocate to enable the restoration of the market’s heritage sheds and construction of below-ground trader facilities (subject to planning application processes later this year). We invite you to drop into one of our information sessions about the proposed pavilion at any time. Staff from the Queen Victoria Market Precinct Renewal team, Queen Victoria Market Pty Ltd management and Breathe Architecture will be available to answer questions and listen to feedback about the pavilion, the planning permit process, or any other aspect of the renewal program that interests you. Email enquiries and feedback can be sent to qvmrenewal@melbourne.vic.gov.au at any time or call 9658 9658. Community and resident groups are also encouraged to arrange a time to meet with the market renewal team.